For a few minutes after the house lights went dark Friday night at Ruth Eckerd Hall, some 2,100 fans could’ve been forgiven for wondering: Wait, where is John Mellencamp going? Not many concerts come with a kind of spoken-word user’s manual, but John Mellencamp’s show Tuesday night at Stifel Theatre did. That’s the kind of announcement nearly every concert could use. The Rock & Roll Hall of Famer delivered on his promise with a set dominated by hits, favorites and a couple of n cover tunes, and the audience held up its part of the bargain, too. But it was those quiet and lesser-known songs that gave the evening some of its most resonant moments. Mellencamp performed a stark, dramatic take of his 2017 song “Easy Targets,” which describes the country’s disregard for its most vulnerable citizens and mourns “our country’s broken heart.” Dressed in workman’s coveralls, Mellencamp sang the song’s concluding lines and took a knee as the stage lights dimmed. If that sounds like a promise/threat addressing issues of the day, consider that it’s a song — with slightly altered lyrics — from “The Lonesome Jubilee,” an album released in 1987. Mellencamp, an Indiana native, is rock’s poet laureate of the heartland, but his songs form a more complex perspective on the region than the typical red state/blue state view that dominates the national discussion. The small towns and farms he sings about have been hit hard economically and are politically mixed. They’re purple, like a bruise. Mellencamp made fine use of his six-piece backing band, which included guitarists Andy York and Mike Wanchic and violinist Miriam Sturm. They added dynamic twists and turns to hits such as “Small Town” and “Lonely Ol’ Night” and did a rollicking version of Robert Johnson’s “Stones in My Passway,” the show’s sole offering from “Other People’s Stuff,” Mellencamp’s 2018 album of cover tunes. TThere was no encore or opening act. Instead, the evening had kicked off with a 20-minute film that emphasized Mellencamp’s dedication to his art and attempts to stay true to it — a point underlined perfectly by the show that followed. WhyHunger — a leader in the movement to end hunger and advance the human right to nutritious food in the U.S. and around the world—will present singer-songwriter John Mellencamp with the ASCAP Harry Chapin Humanitarian Award during the 20th annual WhyHunger Chapin Awards on June 5, 2019 at City Winery in New York. The ASCAP Harry Chapin Humanitarian Award shines a spotlight on artists who have proven their commitment to striving for social justice and creating real change in combatting hunger worldwide. Over the past 20 years, WhyHunger has honored a cadre of artists at their annual Chapin Awards including Harry Belafonte, Pete Seeger, Barbra Streisand, Yoko Ono Lennon, Tom Morello, Jon Batiste, Jackson Browne, Judy Collins, Emmylou Harris, Darryl 'DMC' McDaniels, Michael McDonald, Peter, Paul & Mary, and Kenny Rogers. One cue that this wouldn’t be the typical concert was its billing as “The John Mellencamp Show” and the note that it would start promptly at 8 p.m. The film stoked the audience for the arrival of Mellencamp and his six-piece band for a 90-minute music set that almost lifted the roof off the building. As Mellencamp, self-billed as the “American Poet,” told the largely middle-aged crowd, “There’s going to be songs you know, songs you don’t know, songs you can sing along to and songs you can dance to.” And that was no lie. Mellencamp, who’s logged 22 Top 40 hits and earned a Grammy Award, has been rocking his own blend of blues, rockabilly and solid rock ‘n’ roll since the 1970s but he sounded as fresh and as powerful as ever, and when he slung low in that squatty rocker’s crouch to wail on his guitar for “Paper and Fire,” it may as well have been 1985 all over again. The role of the troubadour, a Middle Ages musician, was to travel from village to village and kingdom to kingdom, to share with the common people important developments of war, famine, power, and palace intrigue. Because literacy rates were low, the troubadour told the news in rhyme and with melody so that it would become memorable to the audience. John Mellencamp once said that had he not achieved any success in the rock and roll genre, he would have lived as a modern troubadour – throwing his old acoustic guitar in the back of a rusty, used car, and driving the highways, county roads, and backstreets of America, singing his songs and telling his stories to whatever barroom or coffeehouse crowd would listen. After selling millions of records, scoring 23 top ten hits, and winning nearly every musical award of prestige available to a performer in his generation, his professional prosperity is inarguable. Remove the accessories and amenities of “rock star” status, however, and it becomes equally clear that Mellencamp’s artistic mission and message is no different from the unpackaged and primitive troubadour of antiquity. 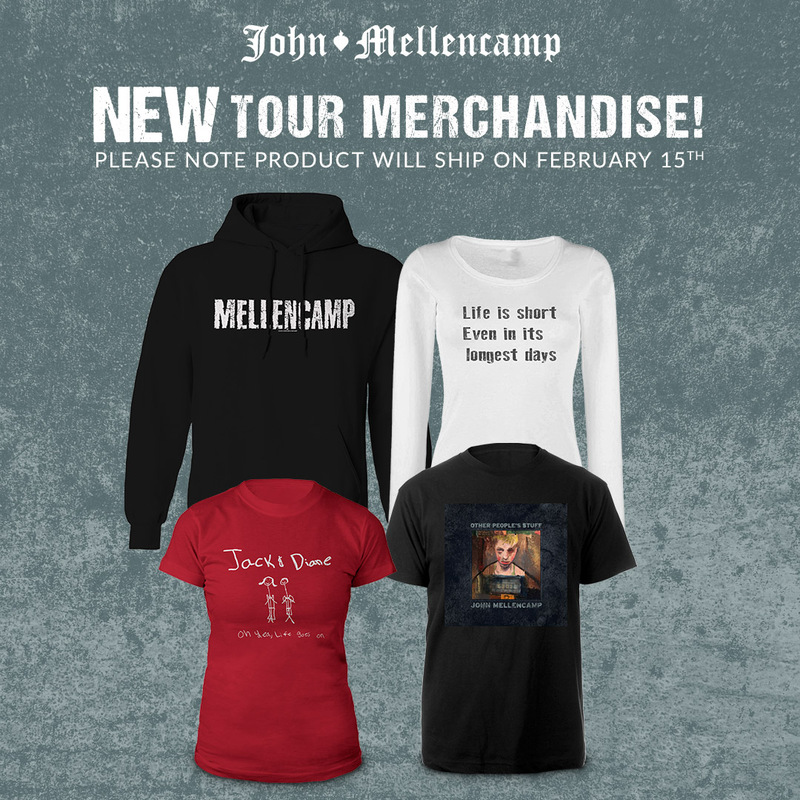 Rather than an old car with a loud muffler and dented fender, Mellencamp arrives in town in a tour bus, and instead of a single guitar in a scratched case, a truckload of instruments accompanies he and his band. As his international popularity proves, Mellencamp writes and sings songs that resonate with people who live “out in the sticks,” to use a phrase from his own “Cherry Bomb,” and those who, as Jack suggests in “Jack and Diane,” “run off to the city.” The origin of his art, even so, has the particularity of roots in where “they are not.” The characters who populate his songs soar and suffer far from the glamour of Hollywood, the gild of New York, and the governance of Washington DC. The songs that Mellencamp sang – the stories he told – in Peoria presented vignettes and vistas of an alternative America. Although Mellencamp made only one overtly political statement from the stage, it was impossible to separate the American dream of Mellencamp’s music from the monstrosity currently troubling the country. A twenty minute documentary film on Mellencamp’s life in music, and the impact of his songs on his fans, opened the evening. The smoky voice of the singer narrated footage from throughout his career, describing the highs and lows of his experiences, cataloguing everything from his begrudging acceptance of the “Cougar” moniker at his management and record company’s insistence to his heart attack in the early 1990s. The consistency through it all was his commitment to make real music, regardless of whether or not, at least in the beginning, he had a fake name. The testimonies of a diverse range of people, including a painter in Brooklyn and a pastor in Phoenix, who claim Mellencamp as inspiration acted as evidence of his accomplishment. It is tempting to see the broadcast of the documentary to a captive audience as self-congratulation, but it is just as easy to view it as the narration of another story – Mellencamp’s own – a story that stands in stark contrast to the contemporary musical culture of frivolity and flimsiness. It is hard to imagine many of the current crop of hitmakers rolling into Peoria, 35 years from now to sing songs that make people raise their fists, swing their hips, and wipe their tear-filled eyes. Mellencamp’s fiery and angry voice describes the criminality of Wall Street, Catholic priests, and even internet piracy to depict a nation out of control, drunk on its own avarice and ego. The music, unlike the rage of its subject, is full of whimsy. Reminiscent of Bob Dylan’s recent records, it is a traditional shuffle full of light instrumentation. Like Dylan, Mellencamp takes turns that are comedic, closing the gap between comedy and tragedy. If everyone is jockeying for their own power, profit, and pleasure, while they watch the foundation of their nation slip away, maybe in addition to a crisis, it is also a bad joke. “Lawless Times” transitioned seamlessly into “Troubled Land,” a dark blues song from another recent Mellencamp release, chronicling the despair too prevalent in a country at war with itself. Dane Clark, pulling off the first of many musical tricks, kept a basic beat but did so with aggression and dynamism. The guitars had the crunch and grind of a bulldozer, while Miriam Strum played her violin with symphonic beauty. One of the best kept secrets of rock and roll music is that Mellencamp has one of the most capable and powerful bands in the business. No matter what story he tells, their execution of his composition enables his music to resound with full force. Mellencamp’s vocal was its roughest in the earliest portions of the show, but with each song, he was able to hit higher notes and shout with greater clarity. It was almost as if the urgency of his lyrics, the excellence of his band, and the promise of his purpose strengthened his voice with each second. To round out the opening quartet, Mellencamp returned to his classic record, Scarecrow. An album elemental to the emergence of the Alternative Country genre, it animates the lives of family farmers, lonely lovers, and elderly mill workers. “Minutes to Memories,” one of the best songs Mellencamp has written, had the Peoria audience singing along loudly to lyrics like, “An honest man’s pillow is his piece of mind.” It was an endorsement of an America alternative to the country visible on television news channels. It was an endorsement of an America where money does not dictate behavior, but virtues of fidelity, integrity and compassion are triumphant. “Small Town” brought a roaring audience to its feet. Mellencamp has always expressed derision of the term, “Heartland Rock,” but if such a classification is legitimate, these are among it most definitive songs. They are rock and roll with twang – simple but emotive guitar meets an earnest vocal; plainspoken yet poetic verses of substance leading into booming, anthemic choruses, a solid and propulsive drum beat more Motown than British invasion. An alternative America, unlike the culture accessible through social media, is one where not every thought and feeling is worthy of amplification, and not every outburst and vulgarity is welcome. Acoustic versions of “Longest Days,” “Jack and Diane,” bolstered by a deafening crowd sing-a-long, “The Full Catastrophe,” with Mellencamp channeling Frank Sinatra and Tom Waits while the keyboard player provided the sole accompaniment of bluesy and jazzy piano, and “Easy Target,” a ballad paying tribute to Black Lives Matter, complemented each other well. Before playing a note on his acoustic, Mellencamp told the story of the inspiration of “Longest Days.” His grandmother, while dying at the age of 100, told him, “Life is short even in its longest days.” The poignant, heartbreaking and soul caressing performance put Mellencamp’s number 1 hit, “Jack and Diane,” in an entirely new frame, making it clear that even in his early years of rock stardom, Mellencamp was exploring the tragic side of human life, and wrestling with the most universal of all truths: mortality. While the plaintive piano notes of “Easy Target” travelled throughout the theater, Mellencamp declared his belief in “a living wage” and in “equal access to great education” to mitigate and prevent extreme income inequality. As the song ended, the singer took a knee. In the alternative America, art is not reducible to background noise, the farce of “reality” television, or Twitter feeds. It is the medium through which people can explore the most critical of experiences – the life and death matters of urgency in the public square of politics, but also in the private spirit of individual introspection. With his band wearing formal attire, and given his well-earned status of elder statesman of American rock, Mellencamp might no longer seem like the rebel of Johnny Cougar era, but he is every bit as rebellious as he was when he made his debut. His enraged and impassioned delivery of “Rain On the Scarecrow” and “Paper in Fire,” especially following “Easy Target,” demonstrated an authentic fighting spirit of protest, desperately needed in a musical culture that has become far too complacent. Bassist Jon E. Gee fought with his instrument as if he were taming a wild animal during “Crumblin’ Down,” playing a muscular line that would have made Lemmy Kilmister proud. The band plowed through with the pull of a truck, and Mellencamp hit his notes with deftness and emotion. On the next song, when he sang, “I fight authority…” it was easy to take his declaration at face value. I was not yet born during the days of alternative America that “Cherry Bomb” describes, but hearing a romantic tribute to moments of forgiveness, friendship, optimism, and honesty, I knew that, even if it is nostalgic or overly idealistic, that is exactly where I want to live. After more than forty years of making music, John Mellencamp has solidly come into his own. In Mellencamp’s early years, his management tried to mold him into a rock star and tagged him with a series of names that he’s still shaking off (I still reflexively catch myself saying “Cougar” even though he dropped it decades ago). It would have been easy to write him off as another flashy rock singer with a goofy moniker, but even back then it was obvious there was something special underneath that separated him from the pack; nobody’s lining up for sold out theater shows from The Hooters or John Cafferty and the Beaver Brown Band in 2019. Maybe it comes from Midwestern roots, maybe it just comes from growing up in a town where excitement is chili dogs and Friday night football and having a moment of clarity that there’s more out there. While Mellencamp’s early work hinted at the miniature drama of living in small town Midwest, those themes were easy to lose among straight ahead rockers like “I Need a Lover” or smooth radio gloss like “Ain’t Even Done with the Night”. You can hear him reaching for it on American Fool (“Jack and Diane”) and getting closer on Uh-Huh (“Pink Houses”), but maybe those songs give themselves up too easily. After he found success and got his feet under him, he paused, pulled back and took a wider world view and let the world fade to black and white. With new perspective, his work came into sharp focus on 1985’s Scarecrow. The black and white cover (by recently-deceased Chicago photographer Marc Hauser) hints at the seriousness of the work within and the opening stark, cinematic lyrics drive that home: “Scarecrow on a wooden cross/Blackbird in the barn/Four hundred empty acres that used to be my farm.” His protagonist went from making out with girls in the back seat to worrying about the family farm going under in the space of five short years. Realizing electric guitars were limiting to his new vision, he took it further and stretched out sonically on Lonesome Jubilee, embracing folky instruments and lacing the songs with lovely bits of banjo, dulcimer, dobro, mandolin, accordion and, the greatest addition- Lisa Germano’s sadly beautiful fiddle. As his sonic palette and social awareness expanded, his writing elevated to match his new reach. It was still Reagan-era America and people were promised a new era of rebirth and economic security; working folk were reassured that it was “Morning in America.” But morning light casts long shadows and daybreak hits harder when it’s at the end of a bleary-eyed third shift you had to work to put breakfast on the table. His confidence and ambition let him tackle the new sound and mature subject matter with a credibility that a young Johnny Cougar could never have mustered. To cap it all, as his influence, social awareness and network spread, he joined with Neil Young and Willie Nelson to start Farm Aid (an organization that supports family farming and is still going strong) and gained a whole new level of street cred. Over the last four decades he’s stayed active with music, film and painting and is ready to release a new album. The song is five years old, but it’s wry sense of humor bites even harder today. While there was always an underlying layer of the blues to his music, it often got blended and diluted with country, rock and folk. He shed his guitar and paced the stage, digging into Robert Johnson’s “Stones in My Passway” and working the lip of the stage with preacher-like fervor as the lights cast him in stark relief. The band exited, and John put on an acoustic guitar and set up the intro to “Longest Days”. He recounted a story about visiting his grandmother when she was bedridden and near the end of her life. She asked him to pray with her and near the close of her prayer she told Jesus that she and John (Buddy) were ready to come home. He was shocked and babbled that he wasn’t ready to come home yet, he had a lot more sinning to do. His grandma chastised him for being sarcastic when she was talking to Jesus and admonished him, “Life is short, even in its longest days”. As enjoyable as the full band numbers were, this song highlighted the simple purity and distillation of a lifetime of songwriting. It made me want to see him do an entire acoustic solo show just to see how the shades of the songs change when they are stripped down to their bare essence. In the film before the concert, and older clip of John expressed how he got frustrated having certain expectations for performing and the danger of becoming a human jukebox. It seems he’s made peace with it because as he strummed the opening of “Jack and Diane” the crowd rippled with excitement. The crowd sang along, and John moved away from the mic entirely during the chorus. He likely could have just played guitar and let the audience sing the entire number; nobody would have complained. After that crowd pleaser, he decided to throw a few curveballs. It’s not quite Billie Holiday’s “Strange Fruit”, but it’s a long way from the Tastee Freeze. And just to stretch the audience a bit more before snapping back for the second half, the violinist and accordion player ran through an instrumental medley of several of John’s songs. The audience perked up as the band played the recognizable strains of “I Need a Lover”, maybe expecting Mellencamp to come out and pick up the song, but it was not to be. For all the work he’s done in the last few decades, the back half of the show features material solely from his 80s catalog (Uh-huh, Scarecrow, Lonesome Jubilee). It’s a run through of some of his strongest work, a set that could have maybe been the A-side of a beat-up cassette of his hits you would have made back in the day. As the evening wound down, John told a story about gathering his kids around years ago and wanting to tell them about the past. He said he’d never been much for nostalgia but felt he should have the discussion. He marveled that after about three minutes his son Hud (then 9) said, “I hate to tell you dad, nobody cares about the past” and walked away. John pointed to the side of the stage and said his son Hud (now 24) was here tonight with his Cincinnati girlfriend and that it’s ironic now because to them eighteen months is the past. “For me, eighteen months is a nap”. He cracked that he’s not going to sleep anymore, only nap, because you never hear: “John Mellencamp died in his nap…it’s always his sleep”. As much as Hud discounted nostalgia, John pulled him and his girlfriend to help out on a song all about nostalgia. Even after that strong run of songs, “Cherry Bomb” was his finest moment. The song has such an easy sway and grace to it, led by the simple steady thwack of the drums, the bounce of the bass that incredible fiddle. On record, it was a time when the world slowed down, and he was confident enough to let the song breathe and spin out. He even stepped back and let a woman take part of the vocal duties. He realized that he didn’t need to be in every frame of his own movie and his hand was firm enough to guide the song, but light enough not to weigh things down. Hud and his girlfriend danced and smiled, and he gamely leaned in to help sing the chorus. From time to time, they smiled and put their arms around each other. The lyric “Seventeen has turned thirty-five/I’m surprised that we’re still livin’” could have come across as maudlin or self-pitying, but it seemed more matter-of- fact. Like one day you turn around and suddenly your youth is gone, and you have kids of your own to worry about and you just say, “Huh…how did that happen?” If he felt any irony about singing it at 67 it didn’t show. And when he sang, ‘Got a few kids of my own…” and looked lovingly at Hud, it was a perfect moment, maybe one that will only happen in Cincinnati. Maybe someday Hud will tell the story to his kids – if they’ll sit still long enough to listen. Enjoy two tickets for a John Mellencamp Camp Show performance. Plus, John will personally autograph a Silvertone Dreadnought Acoustic Guitar for you. Location of Seats Unknown but artist-list. To assure your choice please pick performance as soon as possible. Then, winner will be required to provide attendees full names and cell number 2-weeks before listed event date. Guitar will be signed to the name of the winner's choice. Please allow 1-3 months for signing. Once details have been confirmed no changes can be made. All sales are final. All tickets must be used for the event and or experience initially confirmed. Received mine today...thanks! Stupid question...what is the fabric thing that unfolds? It is a picnic blanket. I've been listening to John since I was a kid, and just stuck with him. He's the ultimate male singer/songwriter. He somehow managed to speak to me in a small town about some of the issues in life we never think other people understand. I've recently been picking up the missing albums from my collection, and just managed to get the Rural Route set. Been a visitor here for a while and figured it was time to join.